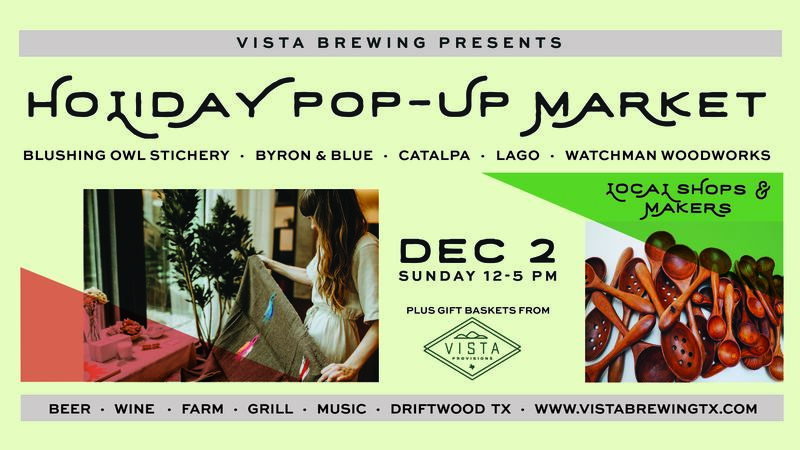 We’re super excited to host an awesome group of local makers for a Pop-up Holiday Market at Vista on Sunday, Dec. 2 . Find unique holiday gifts for the special people on your list, or pick up something for yourself! We will also have a limited number of “build your own” gift baskets from our Vista Brewing retail shop! Here’s a list of the Austin-based shops we’ll have on site from 12 – 5 PM. Stop by and chat with them about how they make and curate their unique collections. Blushing Owl Stichery: Cheryl hand stitches beautiful, colorful hand stitched hoop art. She creates whimsy and humor with thread. You’ve seen her Texas wildflower and cactus art in Vista’s shop. Byron & Blue: Alexia curates a home goods shop curating ethically made pillows, blankets and baskets from Morocco, Turkey and Mexico and based in Austin, Texas. They are the maker of the lovely picnic blankets you’ve seen in the Vista shop. They will have an array of blankets and much more! Catalpa: Kate is a one-woman, mostly a vintage and antique textile shop with the occasional piece of furniture or knick-knack. LAGO: Erin has created a line of leather goods handmade in Austin, TX. Pieces are inspired by travel and the intersection of Italy and Texas, with simple designs and an emphasis on function and durability. LAGO is a workhorse in your life; for travel, work, and even to upgrade errands. Watchman Woodworks: Dave focuses on wooden wares for daily use in the home and kitchen. Each piece is carved by hand with an emphasis on function and form.